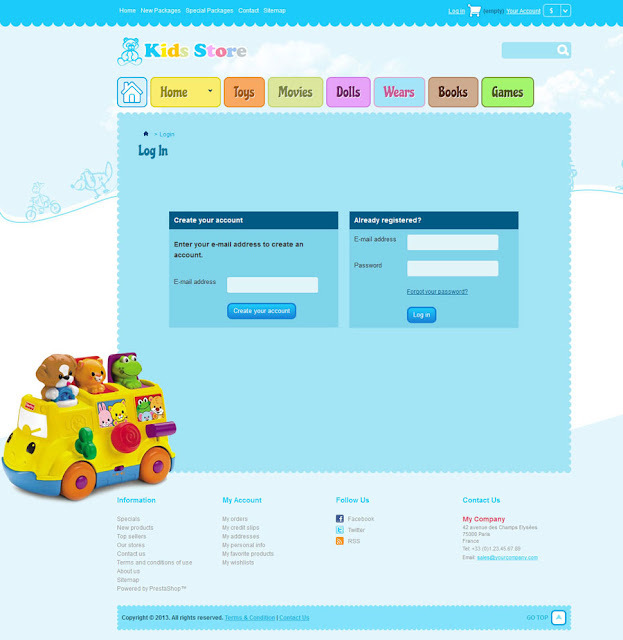 This Kid Store 2.0 responsible themes is in blue color and most suitable for those seller who want to increase their sales on the title of kid’s wears, kid’s books, kid’s toys, kid’s game many more related with kids and baby. This two column website with single column in home page. In front page we have focused image slide show with 3 additional banner. To promote and more socialize we have integrated facebook, social fan box in right side. So that you can promote your facebook fan page easily. 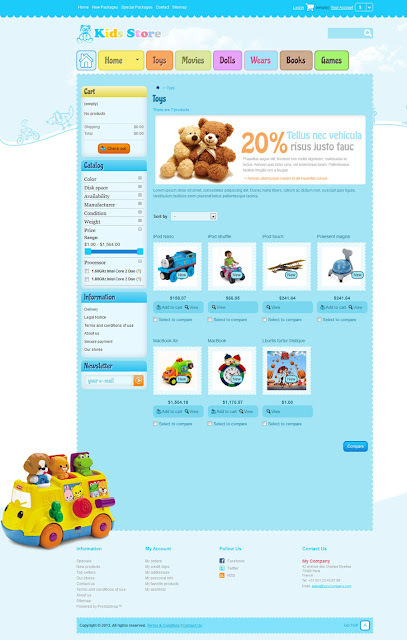 This themes is compatible in 4 different language – English, Spanish, French, Italian respectively . All the language was translated through Google online language translation tool. 3 Commercial Banner are included in front page below the front slide show. Here, you can offer and advertise about your product. Front Slide show is best option to hang your online user for a minute . So that you can give message with fancy slide show. 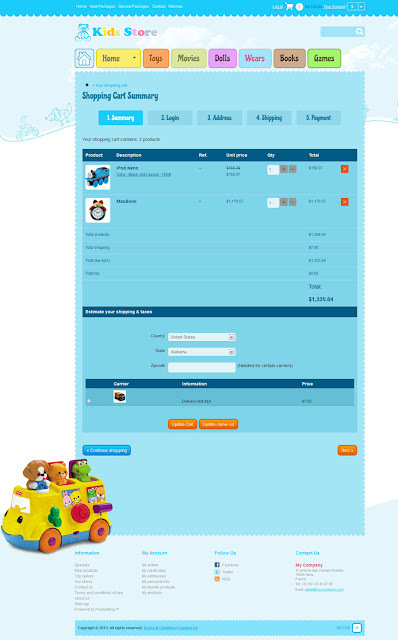 You can configure image slide show from back office. Here you can integrated facebook fan page box module in right side . So that you can promote your facebook page easily . 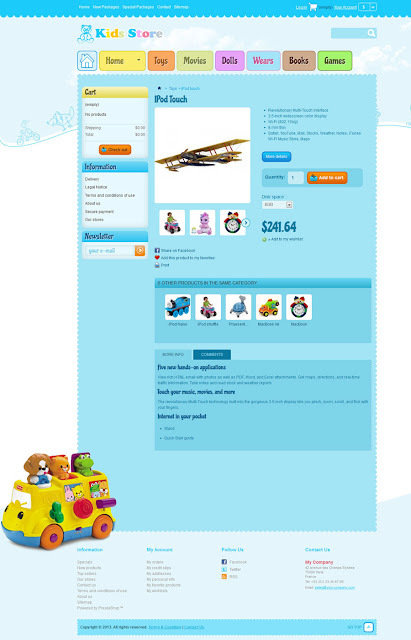 In each product page facebook like button (provided by prestashop) is installed . This will be wonderful if you would like to socialize each product. It’s compatible in major browser IE, FF, Safari and Chrome. Make sure that you are in back office of prestashop and had disabled performance setting. First of all install Template Installer module and click on configure link. In “import form your computer” you need to select your installation zip file and click next . Go step by step with default configuration of prestashop until you reach in final step. Do not forget to regenerate all thumbnails. This module is located in “Other Modules” module category . Here you can add and delete image. Image dimensional with 940×450 is recommended. This module will found in “Other Modules” module category. Here you can put your facebook page link. Home Advertising First, Home Advertising Second, Home Advertising Third and Home Picture. These modules are from “Advertising & Marketing “ Module category . Here you can change picture. We recommend to upload image dimensional having 292×194 for home advertising First/Second and Third. For Home Advertising you can upload as you wise.